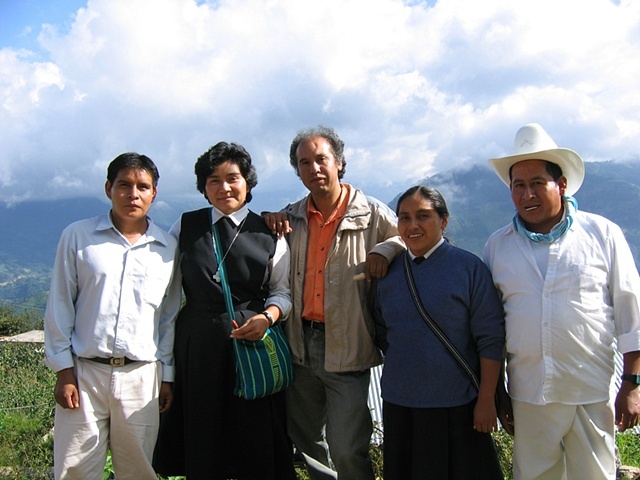 With friends Jose, Chundo, Pancho, and the Hermanas (Sisters) whose names escape me, in the high, high, high Sierra. An absolutely nutty and breathtaking drive to arrive. We had just attended a UNITONA meeting in a Náhua community and stuffed ourselves full of mole. UNITONA is an autonomous indigenous organization in the Sierra Norte of Puebla State. It stands for the United Totonac Nahua Indigenous organization. They are fighting to preserve native corn diversity from industrial agriculture and genetically modified seed; to preserve indigenous languages, customs, and traditions; and for the cultural, physical, spiritual, and ecological survival of their communities. The Catholic church is very active in working with indigenous groups, which seems to me to be a mixed bag at times. In the Sierra, they actively promote a sort of revival of indigenous traditions, within the auspices of the church, of course. The priests and nuns largely influence/temper the political activities, which, depending on your politics, can have some interesting outcomes. It still seems like a paternalistic set-up to me, although I met many wonderful priests/nuns/laypeople doing great work. In this photo we are stopped on our way down the mountain, for some reason we all had lollipops.